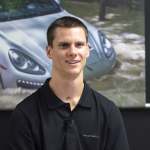 Continuing a long Porsche tradition of recognizing and rewarding young driving talent around the world, Porsche Motorsport North America (PMNA) and Porsche Cars North America (PCNA) teamed together to bring that same development strategy to North America through the Porsche Young Driver Academy with excellent results. For the second year, Porsche returned to Barber Motorsports Park on September 15th-16th with a new set of promising drivers to put through its encompassing Young Driver Academy. The “class” of 2013 includes three drivers from the two North American one-make IMSA Porsche GT3 Cup Challenge series and “at large” participant nominated by the International Motor Sports Association (IMSA). The Porsche specialists include David Ostella of Toronto who recently captured the Ultra 94 IMSA GT3 Cup Challenge Canada by Michelin, Lehi, Utah’s Madison Snow who is the current point leader of the IMSA GT3 Cup Challenge by Yokohama and Angel Benitez, Jr. of Venezuela who is third in points behind Snow in the U.S.-based series. Michael Lewis, from Laguna Beach, Calif., is the only driver without extensive Porsche GT3 Cup racing experience. He is in his second season of racing in the Formula 3 Euro Series. Adapting techniques based on Porsche’s European Junior selection process, the Young Driver Academy provides up and coming talent on the North American continent an opportunity to reap many of the same benefits as their counterparts in Europe. 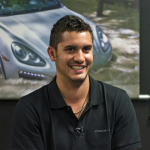 The primary task assigned to the Academy by PMNA president and CEO Jens Walther, is discovering talent in the United States and Canada that can maximize their potential in the Porsche system. The four drivers invited to participate this year all have significant experience and impressive résumés. The intention of the Young Driver Academy is not to teach them to drive or race, but instead to provide them with insight and instruction to further develop their careers. Then, to take those lessons and, based on the recommendations of Porsche, to continue that development in the best fitting environment. In the two-day academy at Birmingham, Alabama’s Barber Motorsports Park, drivers benefit from on-track assessment by Porsche racing legend and lead driving instructor at the Porsche Sport Driving School (PSSD), Hurley Haywood (St. Augustine, Fla.), Porsche factory driver Patrick Long (Playa del Rey, Calif.) and 2011 Rolex GT Champion Andrew Davis (Athens, Ga.). The inaugural Young Driver Academy class of 2012 has had its opportunities to follow Porsche’s recommendations and excel this season. The results have proven Porsche’s founding concept that the Young Driver Academy is to help nurture and develop driving talent in a wide range of series. After attending the academy in 2012, Cooper MacNeil (Boulder, Col.) is in the process of defending his American Le Mans Series GT Challenge (GTC) championship in the WeatherTech Alex Job Racing Porsche 911 GT3 Cup car. He currently leads the 2013 championship by nine points with three events remaining. This success comes despite MacNeil being a full-time student at the University of Colorado at Boulder. Kyle Marcelli (Canada) split his time in 2013 between ALMS Prototype Challenge, where he scored a second place finish at Sebring, and Porsche Carrera Cup Germany, where his Academy recommendation gave him the opportunity to run select races with the German team Molitor Racing and to participate in the Porsche Supercup tryouts. The experience gave Marcelli a taste of world-class GT racing in a series in which most of the current Porsche factory drivers cut their teeth. Sean Johnston won the 2012 IMSA GT3 Cup Challenge by Yokohama prior to attending the Academy. He is currently running selected Porsche Carrera Cup Germany and Porsche Mobil 1 Supercup races with Team Project 1. He has used his partnership with Tom Driscoll, owner of Driscoll’s berries – the largest berry farm in the U.S. – along with his Academy recommendation, to gain invaluable experience. The Porsche Mobil 1 Supercup races in conjunction with Formula 1 all over the world. Angel Andres Benitez, Jr. 24 years old, from Valencia, Venezuela. Currently in third place in the IMSA GT3 Cup Challenge by Yokohama Platinum class point standings driving for NGT Motorsports. Benitez has won four series races including Watkins Glen earlier this year. The Glen event was the 100th GT3 Cup Challenge race held. In 2012, he was IMSA GT3 Cup Challenge Gold class champion, winning 11 of the 15 rounds and finishing off the podium only once. Michael Lewis. 22 years old from Laguna Beach, Calif. and currently attending Cal State Fullerton. He is in his second year running the Formula 3 Euro Series driving a Mercedes-powered Dallara F312. In 2012, he scored one win and several podiums, ending the season eighth in the championship. As a result, Lewis became only the second American to be selected to the FIA Institute Young Driver Excellence Academy. In 2011, he was top rookie and second overall in the Formula 3 Italia Championship. David Ostella. 21 years old from Maple (Toronto area), ONT. Ostella had a terrific 2013 winning the Ultra 94 IMSA GT3 Cup Challenge Canada by Michelin with two podiums at the final event at Calabogie Motorsports Park in Ontario. In only his first year in sports car racing, he finished the season with two wins and nine podium finishes. He also competed in several IMSA GT3 Cup Challenge events in the U.S., with a fourth place at the most recent Baltimore street race. Additionally, he ran the 12 Hours of Sebring in 2013, winning the Prototype Challenge class with co-drivers with David Cheng and Mike Guasch. Madison Snow. 17 years old, from Lehi, Utah, a senior in high school. At the age of 15, Snow won the 2011 IMSA GT3 Cup Challenge Gold Cup title, the youngest driver to ever win a Porsche one-marque Cup race, let alone a championship. He moved to the Platinum class in 2012, finishing second in the championship. With five wins in 2013, Snow currently leads the overall points chase by 38 points. Father Martin and mother Melanie are both racers, have won the 1999 12 Hours of Sebring together as well as the first ALMS GTC championship together – both times in Porsches. Nothing against this talented group of young drivers, but Sloan Urry should be invited too. He’s raw, but the talent is evident every time out.